Bottom line: what can I do today with ripple? And why lend anything without interest rate? I initially thought ripple was about loan business somehow. I don't get it guys, please enlighten me. When i was reading about ripple and how it works, in my mind, in a lot of cases i could easily exchange word "Ripple" with word "Bitcoin" or "XRP" with "BTC". Ok let me try and understand this, so you own an IOU from bitstamp cause you sent them .5 btc and then withdraw it your ripple account? Letting bitstamp know that they don't have to account for that .5 bitcoin cause you opted to make an IOU? So who wants to give me some blockchainBTC for the same amount of rippleBTC just to test? I also managed to get .5 btc onto Ripple via Bitstamp. It shows as being sent to me in my history but doesn't show in my balance. 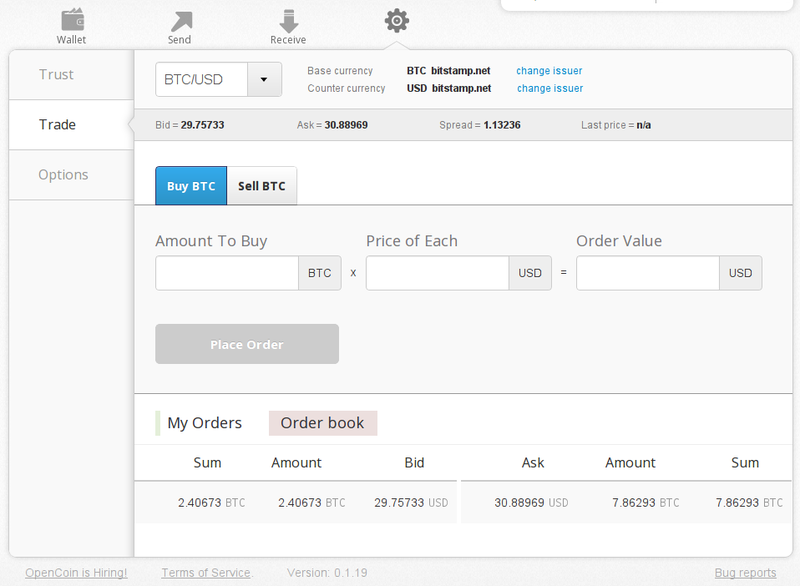 I'm still able to submit an order to sell BTC. I'm not sure what you mean by "they don't have to account for that". Oh cool, you have trusted bitstamp's bitcoin IOUs, I have trusted WeEx's bitcoin IOUs. I wonder if they trust each other? On the one hand I would by default expect not, simply because gateways are not commonly regarded as being in the business of trusting people, so why would they trust another company, especially a company that could even be imagined to be in some way "a competitor"? Companies are made up of people, and trusting people is not what the business is typically assumed to be about. Sticking to a "we are here to be trusted, not to trust" model a gateway would, instead, let its users handle all the "trusting someone other than yourself" stuff. You'd want to have users who trust other gateways, and, furthermore, who are willing to exchange your IOUs for the IOUs of other gateways. Exploitative much? Darn right! The Rules of Aquisition tell us that "exploitation begins at home", but it sure does not end there! Business is all about exploitation! As a gateway, operating a nice clean pure "trust no other" model, the only IOUs you'd accept would be your own. Anyone else's your users can accept if they choose, and the more of them that do the better for you maybe, as their trust networks are opened to you by the fact that they have chosen to trust you (and only to the actual extent/value that they have chosen to trust you). This early in the open beta of Ripple however, I suspect it might happen to be the case that these two "only known offically recognised as gateways gateways" might have been talked into trusting each other, if only a little, if only until they can get users trusting them who can take on some of the opportunities presented by the possibility that someone somewhere sometime might want to trade one gateway's IOUs for the other gateway's IOUs. I see. As a gateway should only have one address there needs to be some identifier to identify the (traditional banking, i.e. bitinstant wallet) account to be credited. Ripple is currently in Open Beta, which is geekspeak for might not always work quite exactly as intended. Tonight when I logged into my copy of the client*, located on my hard drive, using a file: URL ( e.g. file:///usr/src/ripple/rippleclient-git/index.html ), imagine my shock to find all my XRP and BTC were not belong to me! I fired the thing up again, and voila, all my mine are belong to me again! * Built by me, by following the instructions git pulled to me along with the client source code. If this was an answer to my ealier "bug report" (the one with the screenshots), then: ok, no problem. It could however also be possible that for some systemic reason I cannot deposit the bitstamp IOU to my bitstamp wallet... should that be possible or not. In other words: is it a bug or a feature? ok, screw it. I tried sending BTC 0.01 to lebing. It failed in the same way as before with bitinstant. "Your transaction failed to clear, reason: Missing/inapplicable prior transaction." If you are a member of a gateway, exploring its options might pay off in interesting discoveries, and if not, it might at least help get an idea of what options it offers. For example I can easily imagine that some gateways might use different terminology for "depositing" stuff than they use for "redeeming" their own IOUs. Who knows? I'd be interested whether gateways exhibit such quirks. Or any quirks, actually. On my copy of the client, wihch is on my own machine, I'd basically restart it: visit its homepage and see if it still thought I was logged in or offered me a chance to log in (implying I was not logged in). If it still thought I was logged in, yet still didn't seem to have remembered all my whatever (such as maybe yours is not remembering you actually having got what you are trying to send out or something like that) I'd explicitly log the heck out and log back in and see if that would help. Does the person you are trying to send the IOUs to trust that gateway's bitcoin IOUs? Is their trust line already full with no trust left to accept more? To expand on the thoughts of anonymous quoted above. I would add that a distinction must be made between Ripple as a system and XRPs. XRPs are just like oil enabling the Ripple machine to work. The value of Ripple is that it enables dynamic creation of money (denominated in whatever) by the people. All the people need is to extend or obtain trust to or from someone and viola they have created "money as debt" all by themselves without involvement of any bank. The magic of Ripple as money is in "money velocity". A group of market participants can create X BTC of "debt money" and then conduct X*N worth of commerce using this money. The process does not necessarily must involve collateral. Businesses are routinely extend credit to their clients. This is exactly the same action as extending trust to someone in Ripple. However, unlike current banking system where the banking cartel has monopolized the "money circulation" process (SWIFT), in Ripple money are being circulating by the system automatically, in decentralized fashion, without banks necessarily getting involved. This means that Ripple participants can create a little bit of money, just enough for a typical billing cycle. For example, someone who lives "hand to mouth" it would be an amount equal to weekly or monthly salary. Thus this person himself would create enough money for him and this amount would be enough to enable all his day to day transactions. These money will be reused and circulated week after week and month after month. Money need to be created by extending trust but once created they can circulate in the system forever. After all every transaction is simply an adjustment of IOU marker, which goes back and forth. When the banks are criticized in videos such as "money as debt" it is often held against the banks that they operate cooperative system where as a combined entity they create all that visibility of loaning money to people while in fact they full know that actually this money will immediately end up with some other member of this bank cooperative and as such this transaction will be net neutral for the banks plus whatever interest they get from the borrowers who are none the wiser. Guess what? The banks operate a Ripple like system between themselves. They call Ripple trust "correspondence relationship". Now ripple enables everyone to access and create money as needed and enabling commerce while disruptively disintermediating the banksters even further (Bitcoin was the first punch in this double imact combo). P.S. One of the reasons why Bitcoin became all of the sudden more valuable recently could be a new use for it in securing Ripple trust and use as a collateral. This use removes Bitcoin from circulation and necessarily causes its price appreciation. logout/login first seemed to do the trick and it seemed as thought the transaction worked (no error display). However: nothing in history or balance. Trying again turned up the same error. So I guess there needs to be some possible chain of trust from the recipient of the BTC 0.01 to bitstamp (issuer of IOU), right? This doesn't explain why deposit to my bitstamp wallet wouldn't work, though, since bitstamp surely trusts itself implicitly somehow, right? Does anyone trust bitstamp with BTC so I can try sending that person some? concerns me. I didn't enter these orders. What are the yellow entries about? This looks to me like XRP is used as a settlement currency somehow (I thought it wouldn't play that role) and I implicitly value them as shown (which is not the case). Does this somehow imply the "yellow" ones? Am confused. 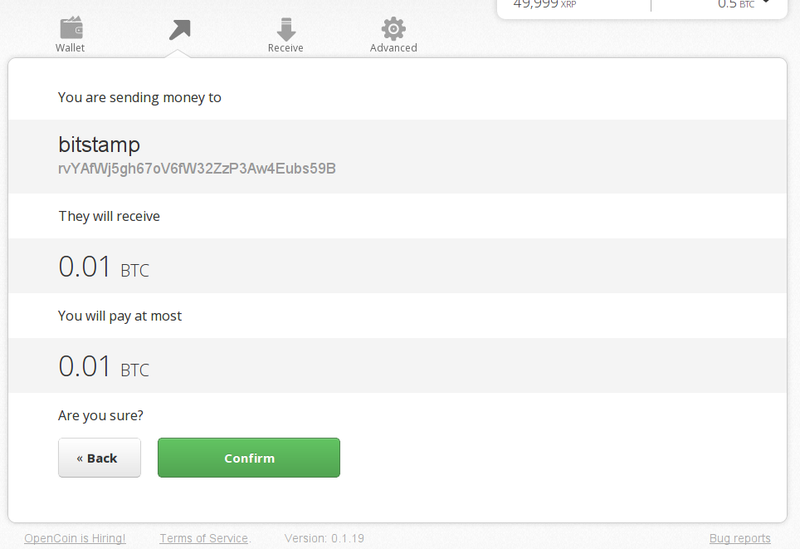 I succesfully deposited btc to bitstamp that i had prevoiusly withdrawn, so i think that is a temporary glitch. thanks. I sent 0.01. It worked this time. I assume you trust bitstamp with BTC?